How scared should the world be of Mexico’s likely next president? THESE days Mexicans agree on two things. Their football team’s victory over Germany on June 17th was magnificent. And the elections on July 1st will be the most important in decades. The front-runner for the presidency, Andrés Manuel López Obrador, leads a coalition called “Juntos haremos historia” (“Together we will make history”). His opponents fear that he will achieve just that, in a bad way. Mr López Obrador, who has run for the presidency twice before, has a folksy air of incorruptibility that enchants many Mexicans. He promises a “radical revolution”. Some hear that as a threat. Mr López Obrador has at times opposed the measures earlier governments have taken to modernise the economy. His critics liken him to Hugo Chávez, whose “Bolivarian revolution” has brought ruin to Venezuela. The nationalist populism he offers is unlike anything Mexico has seen since the early 1980s. And if the polls are right, he will win. With that, Latin America’s second-biggest country will join a clutch of democracies where electorates have rebelled against the established order. What is about to happen in Mexico feels akin to the election of Donald Trump in America, Britain’s vote to leave the European Union and Italy’s turn towards populism. It may be repeated in Brazil, where the front-runner to win the presidency in October is Jair Bolsonaro, who speaks viciously about gay people but warmly of military rule. The causes of popular anger vary. In Latin America, as elsewhere, voters are furious at elites they regard as corrupt, ineffectual and condescending. 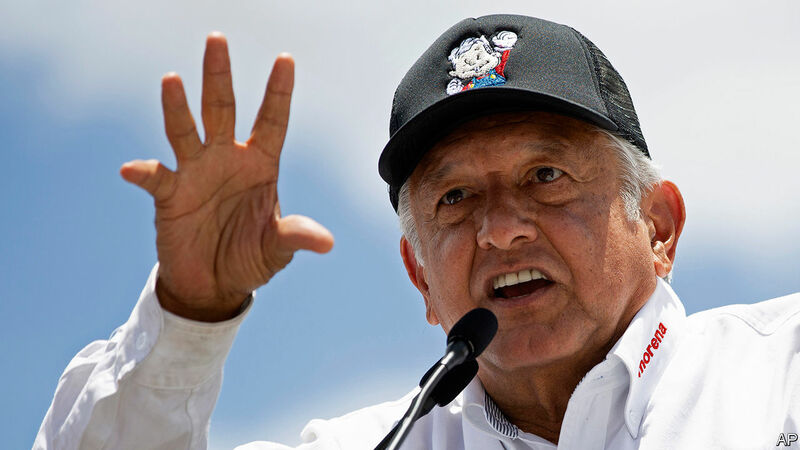 Just as American populists decry the “swamp” in Washington and Brazilians are aghast at the filth of their political class, Mr López Obrador fulminates against the “mafia of power” that he claims controls Mexico. The charismatic leaders who ride these resentments to power are almost always false prophets, promising security and prosperity even as they erode their foundations. The danger they pose to new democracies is greater than in more deeply rooted ones. Mr Trump is constrained by Congress, an independent judiciary, a free press and a bureaucracy with a long tradition of following the law. Mr López Obrador, by contrast, will govern a country that has been democratic only since 2000, and where corruption is widespread and growing worse. The next president’s main job should be to reinforce the institutions that underpin a modern economy, democracy and above all the rule of law. The risk with Mr López Obrador, who will be the first non-technocratically minded president in 36 years, is that he will do precisely the opposite. Mexican technocracy has had its successes. Orthodox economic policies have ensured relatively steady if unspectacular growth since the 1990s. Thanks to the North American Free-Trade Agreement (NAFTA) with the United States and Canada, which took effect in 1994, Mexico is the world’s fourth-biggest exporter of motor vehicles. The outgoing president, Enrique Peña Nieto, opened energy and telecoms to competition and is trying to impose higher standards on a failing school system. Alas, progress has been slower than politicians promised and is uneven. Mexico’s south, where a quarter of the population lives, has ox-drawn ploughs rather than assembly lines. By Mexico’s own measure, nearly 44% of its citizens are poor. The main source of Mexicans’ discontent is not inequality but crime and corruption, which have run riot under Mr Peña. The murder rate has broken a record set in 2011. The ruling party has seen countless scandals. It emerged that Mr Peña’s wife’s $7m home had belonged to a government contractor. In an ordinary election, Mexicans would ditch Mr Peña’s Institutional Revolutionary Party and turn back to the conservative National Action Party. But after its last crime-ridden years in power, from 2006 to 2012, they are fed up with that, too. They want change, which Mr López Obrador certainly offers. What sort of change remains to be seen. The biography that beguiles his supporters is replete with danger signals. Time and again he has shown contempt for the law. He has urged people not to pay their electricity bills. After he lost in 2006 his supporters proclaimed him the “legitimate president” and blocked Mexico City’s main street for weeks. He has said that the courts should be an instrument of “popular sentiment”. His supporters say he has matured, and that his record as Mexico City’s well-liked mayor from 2000 to 2005 shows that he was always pragmatic. He has made his peace with NAFTA and no longer talks of reversing the energy reform. He promises to run a disciplined budget, to respect the independence of the central bank and not to raise taxes. Some of his ideas, like a nationwide apprenticeship programme, make sense. But he seems to have little idea how a modern economy or democracy works. He disparages independent institutions, such as the supreme court. He talks of making Mexico self-sufficient in food and of building oil refineries, which are unlikely to make business sense. His ideas are simplistic. He wants to halve the salaries of senior officials, including the president, and to subject himself to a recall referendum every two years. Though personally clean, he has formed alliances with politicians who are anything but. He denounces Mr Peña’s education reform, which offers poor children a chance of a brighter future. Yes, Mr López Obrador has reinvented himself, but as a bundle of contradictions. That makes his presidency a risky experiment. The financial markets might tame a López Obrador government. But a congressional majority for his party might equally encourage radicalism. It might go well if, say, he curbs corruption or stands up to America over trade. More likely, progress will remain elusive. Mexico cannot stop graft without the institutions Mr López Obrador scorns. And with protectionists at the helm in its two biggest member-states, NAFTA could well collapse. That would further poison relations with the United States, possibly imperilling co-operation over drugs and immigration. We worry about Mr López Obrador’s presidency, but wish him luck. If he fails, worse may follow. Do markets look a little weird right now? That is a question many investors might be asking. In recent weeks geopolitical tensions have intensified, and the monetary policy cycle is turning in both the US and Europe. Equity markets quivered on Monday, which was the day after China said it would retaliate against new US tariffs by imposing tariffs of its own, but the jitters were modest. Indeed, the MSCI world equity index is up 10 per cent up for the past 12 months — never mind that pesky trade war. This is odd. But what is more striking — and alarming — is that equity valuations are far from the only bizarre feature of today’s markets. If you peer into the weeds of global finance, you will see peculiarities sprouting all over the place. Consider credit. These days, pundits often wail about the rising risks attached to corporate debt. A survey from Bank of America Merrill Lynch shows that 42 per cent of asset managers now think that developed world companies have borrowed too much money— beating a previous 2008 peak of 32 per cent. No surprise there, perhaps: corporate borrowing has indeed soared, amid numerous leveraged buyouts and mergers, and almost half of all US corporate bonds issued this year carry a risky rating of triple B-plus, triple B or triple B-minus. What is startling is that investors are not running scared. Instead, demand for risky debt is so high that the spread between safe and hazardous corporate debt (bonds rated triple A and triple B respectively) is a wafer-thin 50 basis points. In 2012 it was 200bp. The second puzzle is the so-called dollar “term premium”— the US Federal Reserve’s calculation of the extra compensation investors require to convince them to tie up their money in longer term bonds rather than rolling over a series of short-term ones. Normally this would be positive in this stage of the business cycle. The Fed is raising rates, inflation is edging up and the US government will sell lots more debt in the coming years, due to tax cuts and rising budget deficits. But the US term premium has been zero in recent months. More peculiar still, JPMorgan calculated that the global yield curve has recently inverted for the first time since 2007. A third oddity is the lack of correlation between currencies and interest rates differentials. Derivative prices currently suggest that investors expect to see a widening gap between US, European and Japanese interest rates. Citigroup calculates that the spread between projected overnight rates for dollars and euros is 250 basis points, up from 25 basis points in 2016 and 100 basis points last year. In past economic cycles this gap has led to a stronger dollar. That has recently appeared — a bit. On a trade weighted basis, the dollar is 5 per cent stronger than in February, but it is also 4 per cent lower than it was at the start of the year. The correlations seem to have broken down, as Catherine Mann, Citi’s chief economist, points out. The list goes on — and on. Ms Mann thinks it is odd that house prices keep surging in countries such as Denmark, the Netherlands and Canada, even as the monetary policy cycle turns; and that investors keep rushing into US equity markets, even though valuations should favour non-US assets. Then there is the fact that gold prices have fallen 5 per cent in the past two months — even though geopolitical turmoil normally boosts the price of gold. And the Vix index (which reflects expected US equity market volatility) has recently fallen below 15, after rising above 30 earlier this year. That looks completely counter-intuitive given the geopolitical risk — and the fact that some investors holding Vix derivatives suffered big losses a mere four months ago, when this index gyrated. So what explains these odd features? One optimistic explanation might be that investors are so wildly confident about global growth that they presume companies will tackle their debt and produce earnings that justify the share prices. Under this theory consumers would continue paying down their mortgages, as inflation remained low (perhaps because digital disruption will suppress labour costs). But there is another pessimistic explanation: years of ultra-loose monetary policy have made investors so complacent that they are mis-pricing risk. I fervently hope the first explanation is true. But I fear the second is a more likely bet. Either way, the key point is this: don’t assume that markets look “normal” today even if they are (mostly) calm, especially not in a geopolitical world that looks anything but peaceful, let alone normal. Goldman Sachs GS +0.70%▲ and Morgan Stanley MS +0.42%▲ barely passed the Federal Reserve’s annual stress tests, raising doubts about their ability to grow dividends and buybacks over the next year. All 35 banks subject to the tests passed, despite an unusually harsh exam that featured a severe global recession, the Federal Reserve said Thursday. But it was a close call for the Wall Street duo of Goldman Sachs and Morgan Stanley on one particular metric, the so-called supplementary leverage ratio. This is a bank’s total leverage, a measure of total capital as a percent of total assets, including some off-balance-sheet exposures. The two banks’ leverage ratios fell to 3.1% and 3.3% respectively because of losses on loans and trading positions in the most severe scenario, bringing them perilously close the regulatory minimum of 3%. In the next phase of the process, banks will ask the Fed to approve their capital-return plans for the next four quarters and announce the results on Thursday next week. 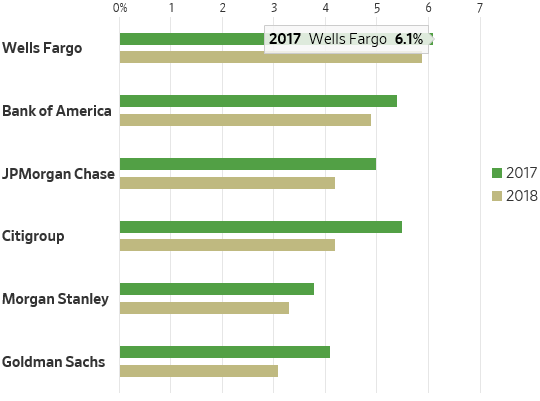 The entire process is opaque, and it is unclear exactly what these two banks’ skin-of-the-teeth passage will mean for their dividends and buybacks. But on the face of it, the results don’t leave much room to lavish cash on shareholders, particularly for Goldman Sachs. Earlier this month, Credit Suisse analyst Susan Katzke forecast that Goldman Sachs would buy back $5 billion of stock over the next four quarters, up from roughly $4.6 billion a year earlier. But this assumed that the bank would get through the tests with a 3.8% leverage ratio, not 3.1%. In a statement, Morgan Stanley said the results “may not be indicative of the capital distributions that we will be permitted to make” when the fuller results are out next week. When a bank’s models diverge from those of its most powerful regulator, the Fed tends to win out. Morgan Stanley and especially Goldman Sachs are in for a stressful week as they await the verdict. The terms Bitcoin and blockchain are sometimes used interchangeably, but there’s actually some misunderstanding about the innovation. In this opinion piece, Kevin Werbach, Wharton professor of legal studies and business ethics, explains the differences among the three groups that comprise this technology: cryptocurrency, blockchain and cryptoassets. These days it’s hard to avoid pronouncements about how cryptocurrencies and blockchain technology could change everything (or at least, create massive wealth). Yet there’s an equally loud chorus labeling them a massive scam, useless, and dangerous. And a surprisingly large audience still doesn’t understand what’s going on. One big reason for the confusion is that we’re not all talking about the same things. The three communities share a basic set of design principles and technological foundations, but the people, goals, and prospects are almost completely distinct. Those involved don’t help much by sniping constantly about which is the “real” movement. So, let me try to clarify things. There is cryptocurrency: the idea that networks can securely transfer value without central points of control. There is blockchain: the idea that networks can collectively reach consensus about information across trust boundaries. And there are cryptoassets: the idea that virtual currencies can be “financialized” into tradable assets. The first truly is a revolutionary concept, but the jury is still out on whether the revolution will succeed. The second and third are game-changing innovations on the path to significant adoption, which are nonetheless essentially evolutionary. Cryptocurrency is what you’ve probably heard the most about, starting with Bitcoin. The easiest way to understand it is not to puzzle over the details of mining or digital cash. Instead, focus on the decentralization of trust, as I do in my forthcoming book. Many activities require trust. Without trust, a $20 bill is just a green piece of paper, a vote in an election is a pointless ritual, and someone offering me a ride in their car is a potentially dangerous stranger. Traditionally, trust meant depending on partners, institutions, or intermediaries. Those centralized trust architectures are powerful; among other things, they brought us modern industrial civilization. But there’s a downside to trust. Trust implies vulnerability. The people, governments, and companies we trust may turn out to be untrustworthy, for any number of reasons. Bitcoin showed that something valuable — money — could be trusted without trusting anyone in particular to verify transactions. The idea, if brought to full fruition (and that’s a huge “if”), could transform society. We could have transparent companies that truly reflect the will of their stakeholders, governments that truly reflect the will of their citizens, an internet freed from the corrupting value-extraction of powerful gatekeepers, the end of fake news, and massive automation of daily life for the betterment of humanity. Or at least, we could have solutions that markedly improve on the status quo. Decentralization is valuable in all sorts of ways. There’s a cost. (There’s always a cost.) For Bitcoin, the costs involve a very slow network with limited functionality that wastes massive amounts of electricity and enriches a side community of miners. Maybe those are worth it. Maybe technological advances, through the parade of new blockchains and blockchain enhancements, will drive down the costs. We don’t know yet. Yes, the bitcoin in circulation is notionally worth north of $100 billion, but that’s cryptoasset thinking. Is anyone using bitcoin yet to do something, other than to get rich, to make a point, or to avoid law enforcement? And it gets steadily worse as one progresses down the list of nearly 2,000 (or perhaps many more) extant cryptocurrencies. There’s also a catch. (There’s always a catch.) What works for small groups, bounded applications, and idiosyncratic users doesn’t necessarily survive the climb to the mainstream. If it does, it often becomes something completely different. Until Facebook came along, it wasn’t clear anyone could make real money on social networking, which was just a frivolous exercise for kids anyway. The fact Facebook did come along doesn’t prove it was inevitable. Some of those betting on the cryptocurrency revolution may be proven right. It’s an exciting bet, with all kinds of potential upside, but still a gamble. There’s a reason true revolutions don’t happen often. And when they do, there tends to be heavy collateral damage. The blockchain* phenomenon grows from the same root as cryptocurrencies — the Bitcoin white paper of 2008 and its antecedents — but seeks something very different. Rather than trying to do without trust, blockchain starts from the premise that our trust is too limited. We only really trust ourselves, or our own organization. Yet no person, or company, is an island. Even the government of an island isn’t an island, for that matter, when it has to trade and interact across the water. The world is filled with processes, especially among larger companies and governments, where things must be tracked from one trusted zone to another. Firms spend $10 trillion per year globally on “logistics,” which is short for putting stuff on transportation systems controlled by someone else. Manufacturers, distributors, and retailers keep their own trusted (yet independent) records of the same items as they flow through supply chains. When you walk into a new hospital or doctor’s office, your medical records don’t necessarily walk in with you. They are even less likely to walk out together with the new ones you generate. All of these breakdowns in information flow feed the fearsome dragon known as transaction costs. According to the dominant school of economics today, the effort to slay that dragon is the essential driving force in the economy. A significant chunk of the transaction costs between firms (and sometimes within them) flow from the limited elasticity of trust. If every party to a transaction trusted the information involved, even though they didn’t trust one another, costs could fall and performance could improve drastically. That is the essence of the blockchain vision. Trusting your own records on a blockchain is tantamount to trusting everyone else’s records, because those records are one and the same. The duplication of settlement, the further duplication of reconciliation, the further duplication of auditing, and perhaps the further duplication of regulatory reporting, can all fold into the original transaction. The most prominent companies in the world are participating in all manner of blockchain trials and consortia because they see the huge potential. Decentralization here is one design goal among several, not a foundational requirement as with cryptocurrencies. So these systems typically are “permissioned,” with essential functions limited to identified participants. As with cryptocurrencies, there are aspects of this story that are still speculative. Because the blockchain thesis doesn’t assume any radical changes in markets or business models, though, it’s a question of degree only. Cryptocurrency advocates carp that you don’t need a blockchain for any of these arrangements. Well, you don’t need a blockchain to create digital money either. It’s only when you want to add the condition that banks can’t intermediate, governments can’t block transactions, and no one can influence the money supply that Bitcoin has a purpose. The blockchain thesis similarly targets a particular class of scenarios. Traditional database solutions don’t solve these problems because the people and companies involved don’t agree in practice, not because of some failing in theory. Cryptoassets take cryptocurrency tokens, turn them into instruments of trading, and spin ever more complex financial instruments out of the threads they produce. The potential scale is immense, with trillion-dollar markets not that unusual in modern finance. Where this effort diverges from the first is that it views cryptocurrencies not as a way to facilitate activities without centralized trust, but as a new investment asset class. Because they are natively digital, cryptoassets can in theory be traded more efficiently than existing instruments. They are inherently flexible and global. Virtually all of the major Wall Street players are eager to get in on the action, as are the institutional investors that supply them with capital. Regulatory concerns that kept them out are gradually being addressed. Once the fundamental value of a digital token on a decentralized network is established, why not just use it to make money? (Sorry, to “engage in socially optimal capital formation.”) Cryptoassets depend on the fact of cryptocurrencies, because there needs to be something valuable to trade. Securities must be secure. But cryptoassets ignore or reject the idea of cryptocurrencies, that trust is “almost an obscenity” (to quote the man who did the original security audit on Bitcoin). To the cryptoasset trader, both trust and the absence of trust are nothing but means to an end, known as liquidity. Permissioned blockchains will also support tokenized assets, by the way, including eventually sovereign currencies. The difference is that the goal will be effective tracking more than profitable trading. Another way to think of this is that cryptoassets divorce the exchange function of cryptocurrency tokens from their utility functions. If you want to use bitcoin to pay merchants, Ethereum’s ether to purchase computing cycles for distributed applications, Filecoin to purchase cloud file storage, or Augur Rep to verify the results of prediction markets, you put a value on those tokens based on what you get out of the application. In theory, more demand for use in the application means less available supply, which pushes up the price. In practice, none of the applications are significant yet, so the value of the tokens is highly speculative. Speculation isn’t necessarily a bad thing; it’s the appetite for risk that drives financial markets. Sometimes, though, that speculation drives markets over a cliff. The key question for cryptoassets is whether and how speculative instincts will be modulated. If cryptoasset markets develop, there are all sorts of interesting possibilities for “tokenizing” physical things like commodities and real estate, digital things like intellectual property, and other kinds of rights, using the financial engineering and analytics tools Wall Street has developed over the years. The necessary foundations are already being built. The stories aren’t mutually exclusive, per se. The success or failure of any one vision doesn’t necessarily imply much about the others. Cryptocurrencies have the most disruptive potential, because they promise to decentralize power. That also creates the biggest barriers to success. Both blockchain systems and cryptoassets scale back that decentralization for other benefits. They differ in the uses they target, so it’s not a competition to determine the right answer. Crossovers can generate significant opportunities, but they need to be evaluated in their own lane. Initial coin offerings (ICOs), for example, fuse cryptocurrencies and cryptoassets. Should they be assessed as a new form of crowdfunding or a way to kickstart decentralized economies? What counts as success or failure looks different depending on the answer. Deciding which is the “real” phenomenon can be an entertaining parlor game, but it’s ultimately not enlightening. Any judgments about success or failure of blockchain-related technologies need to be couched in terms of the relevant sub-category. When observers point to enterprise adoption and high prices on cryptoasset exchanges as evidence for the viability of cryptocurrencies, they’re crossing the streams. The fact that there’s massive fraud and theft in the ICO world doesn’t tell you much about government initiatives around distributed ledgers. Whether or not there’s a good business putting banks on blockchains(or something blockchain-like) says little about the prospects for decentralized automated organizations. The sooner we stop treating this as a unitary phenomenon, the more we’ll be able to assess developments accurately. *I use the term ‘blockchain’ for this category, because it emphasizes the value of the ledger over the currency or decentralization. Speaking precisely, though, most cryptocurrencies and cryptoassets use blockchains as well. And not every ‘blockchain’ system employs the data structure of a hash-linked chain of blocks.